Sleeping Beauty (film) In spectacular style, the film recounts the simple story of Princess Aurora, who is cursed by the evil fairy Maleficent to die before the sun sets on her sixteenth birthday by pricking her finger on the spindle of a spinning wheel. Despite the loving attempts of the three good but often bumbling fairies, Flora, Fauna, and Merryweather, the curse is fulfilled. The good fairies put everyone in the castle into a deep sleep until the spell can be broken. It is only with the aid of Prince Phillip that Maleficent, transformed into a towering, fire-breathing dragon, is destroyed, and the Sleeping Beauty is awakened by a kiss. Released January 29, 1959. Supervising director Clyde Geronimi. In Technirama 70. 75 min. 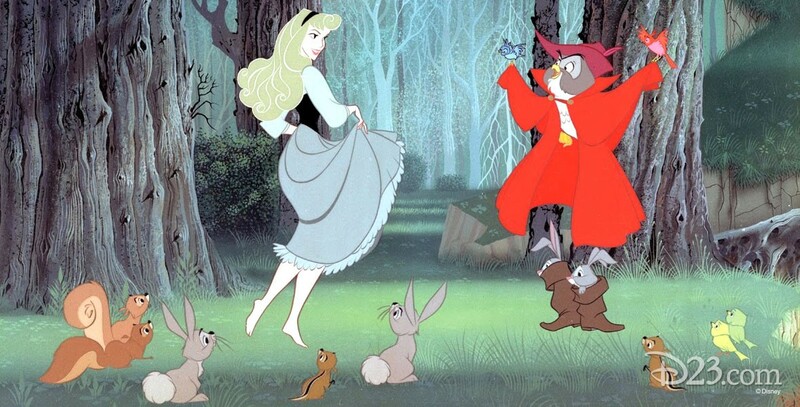 The voice talents include Mary Costa (Princess Aurora), Bill Shirley (Prince Phillip), Eleanor Audley (Maleficent), Verna Felton (Flora), Barbara Luddy (Merryweather), Barbara Jo Allen (Fauna), Candy Candido (Goons). George Bruns’s orchestral score, which was nominated for an Academy Award, expertly blended famous themes from Tchaikovsky’s ballet. Sammy Fain, Jack Lawrence, Tom Adair, Winston Hibler, Erdman Penner, and Ted Sears wrote lyrics to such songs as “I Wonder” and “Once Upon a Dream.” Based upon the Charles Perrault version of “Sleeping Beauty,” the film had an overall stylistic look conceived by artist Eyvind Earle, today known for his paintings and Christmas card designs. With a budget that exceeded $6 million in 1959, this was Walt Disney’s most lavish and expensive animated feature to date. Though not an initial box office success, the film has proven to be a unique asset with popular reissues in 1970, 1979, and 1986. Released on home video in 1986 and 1997.